I'm not a great fan of children's "dinosaur" books. Too often they trivialise the science of palaeontology by presenting it a very superficial way, they frequently confuse the issue by presenting animals such as pterosaurs and plesiosaurs as dinosaurs (though sometimes with a disclaimer that they are not dinosaurs once the initial impressions have been made), and suffer from illustrations which are at best cartoons, at worst bland and stolid representations of a handful of stock dinosaurs. Story lines range from the non-existent, presenting extinct animals with all the excitement and insight of a collection of stamps, to the downright risible. One particular example which had me throwing the book at the wall in anger and exasperation (much to the surprise of my young children) involved a T.rex who decided to become vegetarian after an encounter with some "nice" herbivores. So it was with a element of trepidation that I opened the package containing copies of three books from a new series entitled "Tales of Prehistoric Life" from Kids Can Press Ltd. The books are "Ankylosaur Attack", "Pterosaur Trouble" and "Plesiosaur Peril". They share the same format of a short story, with full-page photo-realistic illustrations, well-produced on good quality glossy paper. It is clear that the authors and illustrators have collaborated closely, and that the publisher has made the effort to produce a quality product. The stories are short, but full of action and would make a good bed-time read for younger children interested in prehistory and would appeal to older children through the quality of the illustrations, and the feature of a final page in which goes into more detail about the scientific evidence on which the story is based. "Ankylosaur Attack" tells the story of an encounter between two Ankylosaurs - small, armoured dinosaurs - and that standard of all dinosaur books, Tyrannosaurus rex. It takes place in a forest, which as far as I can tell accurately renders the plants of the late Cretaceous. The behaviour of the protagonist is consistent with evidence from their fossil record and animal behaviour in general. I have some reservations about the dinosaurs in that they are both presented as dull-coloured and scaly. Given the explosion of our knowledge of theropod dinosaurs over recent years, it seems to a missed opportunity not to present T.rex with a fuzzy covering or even display feathers, changing the rather pastiched image of this dinosaur in the popular imagination. 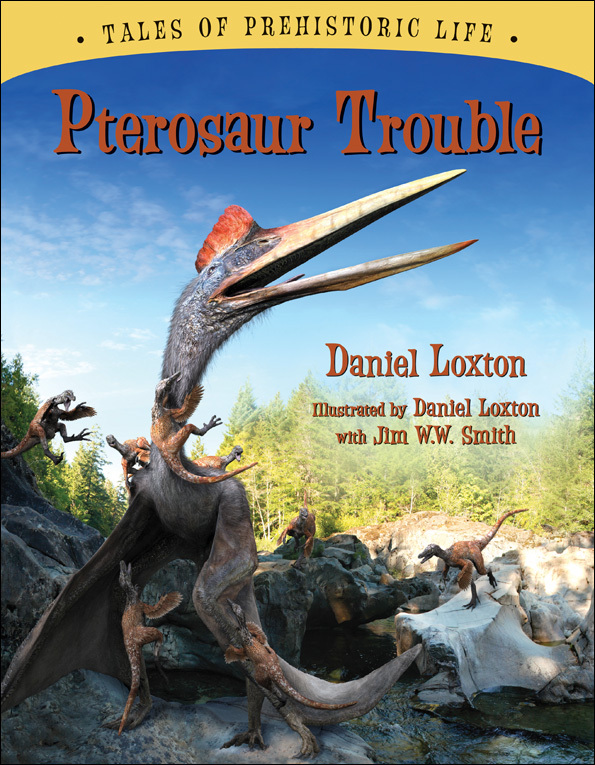 "Pterosaur Trouble" tells the story of the trials and tribulations of a giant pterosaur, Quetzalcoatalus, and his encounter with a variety of dinosaur and his escape from a pack of small, feathered dinosaurs, Saurorniholestes. It takes place in a variety of different landscapes. Again, most of the dinosaurs are rather dull. Saurorniholestes is shown with brown and grey feathers - consistent with recent conclusions over colouration of feathers from studies of their fossils. Quetzalcoatalus is rather more colourful, sporting a bright red head crest. "Plesiosaur Peril" relates how a juvenile Cryptoclidus strays from her mother and has a narrow escape from a ravening Liopleurodon. The underwater scenes are beautifully populated with ammonites, belemnites and other animals of the Middle Jurassic. The plesiosaurs are anatomically accurate - even the dentition of Liopleurodon is correct, something artists usually get wrong! There is perhaps a hint of the notoriously exaggerated Liopleurodon from the BBC's "Walking with Dinosaurs", but the sizes given for both main protagonists are spot on. These books are in a different league from most children's books on extinct animals, combining scientific accuracy with excellent illustrations, and I can recommend them to any parents whose children show an interest in the subject. My main criticism is the choice of font, which to my eyes is clumsy and could be difficult for children just starting to read. All in all, a excellent trio of books. I'm looking forward to seeing more in the series.